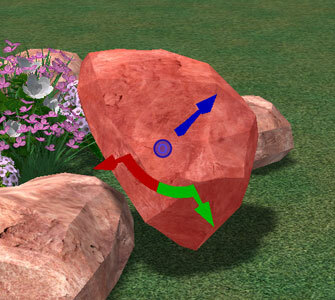 Selectable Objects: You may select and move many objects in 3D. Specifically, shapes drawn in the House and Custom Shapes stages and almost all items inserted from the library may be selected and then moved, rotated, and scaled with the 3D gizmo. Shapes drawn in stages such as the Pool Shape and Deck in Pool Studio or Water Features and Hardscapes in VizTerra may not be selected or moved in the 3D view but can be selected and moved in the 2D view. 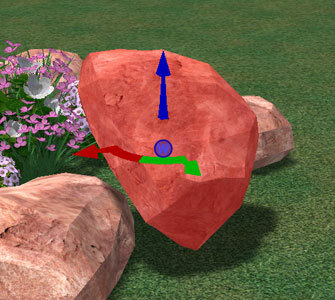 The 3D view in the Materials Stage works completely opposite to the controls described here. Please see Materials Stage for information on selecting surfaces in 3D in the Materials Stage. Selecting by Clicking: In order to select objects in 3D, simply double left click on any object. The selected object will be highlighted in red and your view will rotate to focus on it. If you want to select multiple objects, press and hold the Ctrl key on your keyboard and single left-click the objects you want to select to add them to the current selection. You can select as many objects as you want as long as you hold the Ctrl key. In order to subtract an object from the current selection, left-click on that selected object while holding the Ctrl key. Selecting with the Selection Marquee: With the selection marquee, you can easily select a group of objects with a single mouse movement. Hold the Shift key on your keyboard. The cursor will change indicating that it is activated. While still holding Shift, left-click on any point in the viewport, hold the left mouse button and drag your mouse. You will notice the selection marquee being created and expanded as you move your mouse. When you release the left mouse button, all the objects that are included inside the selection marquee will be selected. The selected objects will be highlighted in red and your view will rotate to focus on them. You can add more objects to the selection with the selection marquee by pressing and holding the Ctrl and Shift keys and following the same procedure above. You may unselect the items by pressing the Reset button at the top of the screen. 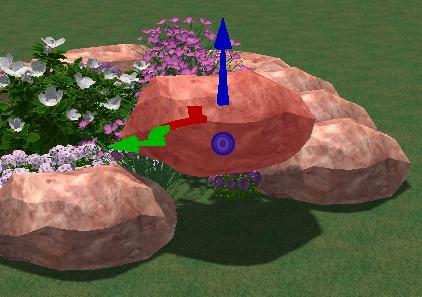 Selected objects may be moved by using the 3D gizmo. The blue arrow will elevate objects up and down. 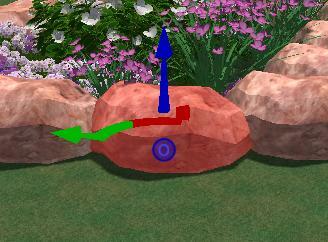 The red and green arrows will move objects left to right and back and forth. You may move single objects, multiple objects, and groups. As you move the cursor over the arrow, it will highlight. Left click and hold to move the object. You can also manually elevate objects by using the elevation box under Parameters. By default objects will be set to Auto Elevation. Turning auto elevation off will allow you to enter a manual elevation into the box. Rotating objects in the 3D viewport allows for more options than rotating in the 2D viewport. Only in 3D can you rotate the selected objects on the red and green arrows. This allows you to tilt objects upright. 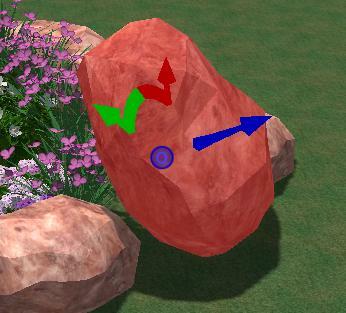 Simply select the object you want to rotate, move the cursor over the arrow, click and hold the left mouse button, and drag the mouse to rotate the object. Release the left mouse button to complete the action. Objects will rotate according to your Angle Snap settings. Only shapes drawn in the Custom Shapes stage or items inserted from the library may be rotated with the red and green arrows. Shapes drawn in the house stage as well as some items from the library such as house decor items may only be rotated with the blue arrow. You may also rotate multiple objects and groups the same way. Please note that the rotation options for a group may limited by the items in the group. For example if a group contains both shapes drawn in the House stage and shapes drawn in the Custom Shapes stage, the group as a whole will only be able to rotate with the blue arrow. 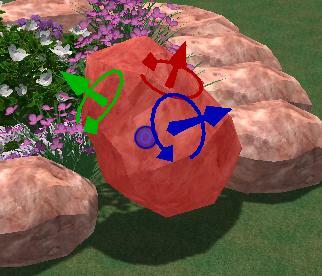 You can also rotate objects by using the Rotation box found under Object Properties. Scaling objects in the 3D viewport is very similar to scaling them in the 2D viewport. You can scale the selected objects uniformly. When you move the cursor over the 3D gizmo, all the arrows will be highlighted. Left-click and hold any arrow of the gizmo, and drag the mouse to scale the selected objects. Release the left mouse button to complete the action. You can also scale objects by using the Scale box found under Object Properties. The Alignment Button in the center of the 3D gizmo allows you to change the orientation of the arrows. Left clicking on the button will switch the setting. “W” represents world alignment and means that the arrows will be orientated to the world. The alignment can be changed with any tool, but is especially important with the rotate tool. The Alignment Button in the center of the 3D gizmo allows you to change the orientation of the arrows. Left clicking on the button will switch the setting. “O” represents object alignment and means that the arrows will be orientated to the position of the object. The alignment can be changed with any tool, but is especially important with the rotate tool.